One of the challenges is that this rust is relatively new to Australia so its potential range and its full range of host plants that are likely to be infected in the wild are unknown. It is now so well established in Victoria that myrtle rust has been declared an endemic disease in Victoria and now host material can enter without restriction. Although at this stage the eradication of this disease is not an option, its spread can be restricted, its impact managed and research will continue with an aim to seek long term solutions. Biosecurity Queensland has advised that the total number of known rust cases in Queensland is approaching 1700 occurring in 21 different local council areas with almost 140 different affected host species. Biosecurity Queensland advocates 5 steps for reducing the impact and spread of myrtle rust should this rust naturally spread to your property. Buy healthy plants. When acquiring new plants for your garden ensure they are free from any rust symptoms. Clean your gardening tools and gloves with detergent after use. Clean your clothes or change your clothes if you have been to the bush, nursery or other vegetated areas prior to entering your own garden. Inspect the myrtaceous plants in your garden regularly. If myrtle rust does establish in your garden monitor your myrtaceous plants and consider replanting with different species. 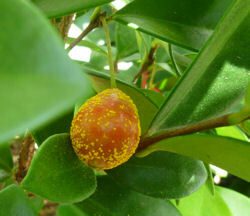 Biosecurity Queensland is still eager to be advised of any infestations of myrtle rust. Please report any sightings by calling 13 25 23 or filling out the online reporting form. More information may be obtained from Biosecurity Queensland or the Department of Agriculture, Fisheries and Forestry.